On October 26, the Deutsche Grammophne record label launched an album by Morten Lauridsen, American composer of choral music, who received in 2007 the National Medal of Arts from USA president, George W. Bush. The album has a few of the most valuable creations by Morten Lauridsen, in a retrospective of his career as a composer, which includes two global premieres. It's no coincidence that the album is coming out now, it's an anniversary album honouring the great personality of this creator, who's now 75 years old. Light Eternal is the title of the album recorded in Austria by the Chamber Choir of Europe and the ensemble 'I Virtuosi Italiani' led by Nicol Matt, with Morten Lauridsen himself at the piano. We are discovering one of the most valuable contemporary creators overseas, who remains anchored in a form of deep spirituality. This emeritus composition professor at the University of Southern California of over 40 years, deeply connected to his homeland, especially to the San Juan archipelago in the Pacific North West, is perceived as a mystic, a poetry and nature lover. He lives this intense human-nature connection on Waldron Island, and musically he inclines towards the bright zones, considering human voice higher than any other instrument and deciding to express through his music, 'the connection to the eternal.' You can actually experience this yourselves without any further introductions. Equally impressive is the reaction of Chamber Choir of Europe's members, who sense and piously follow the composer's intentions, as a priest who has decoded this world's secrets and embraced them with an unearthly serenity. The album introduces us to the works of this musician who, after earning a loyal following in the U.S.A., came to be appreciated all over the world. His music, anchored of course in contemporary language, keeps this melodious quality, providing a sense of serenity, contemplating the smooth relationships between sounds, which in the 21st century are articulated without the fear of being rejected by the constraints of originality at any price, or the imposition of a personal language of sound. And still, this language of personal tones is present in the case of Morten Lauridsen, but it manifests itself on a cathartic level, as he has the gift of provoking the enchanted listener to come back to their own self, as if by magic wand. The sources of inspiration are unlimited - Gregorian music, medieval or Renaissance, brought of course to the path of contemporary sound styles, whether they are tonal, modal or atonal. In addition, the reservoir of composed poems is very diverse, especially since Lauridsen states that he reads poetry daily. In the album summary we find Lux aeterna, the requiem for choir and orchestra composed in 1997 after the death of the his mother, who was the one who opened his musical horizons as a child. There are two more works from the cycle 'Les Chansons des roses' based on the lyrics of Rainer Maria Rilke and two a cappella madrigals from 'Fire songs' based on Italian Renaissance poems. Here we find one of Morten Lauridsen's techniques - a single key, named by him 'the fire key', crosses the entire score through a 'unique and primary sound', to quote the composer. In this global premiere you can listen to a Prayer, composed to lyrics by Dana Gioia, and 'Ya Eres Mia' to the lyrics of Pablo Neruda, accompanied by piano, pages where emotion is filtered through a concentrated message. The four admirable Nocturnals, recorded in Europe in their entirety for the first time ever, and 'O magnum misterium', the work that made Morten Lauridsen famous outside of America, here in a second version recorded by this ensemble, all in a contemplative note, not without its contrasting accents. A few words about the Chamber Choir of Europe, which as the name suggests, is comprised of selected musicians from ten European countries, including Romania. Led by Nicol Matt, the ensemble is famous all over the globe, winning international contests, constantly launching albums, and performing concerts in important festivals. Their lean sound, sensitivity, the capacity for reaching music's essence and especially the warmth of performing are what this choir is known for. This is the second album they produce together with Morten Lauridsen, the young musicians' admiration for the American composer is obvious - you can see it in the trailer for the album launch - and the result of this new production strengthens the fame of every person involved in it, both the performers and the composer. 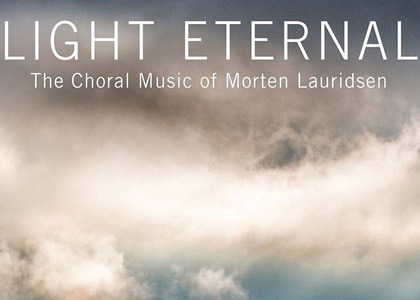 It remains a unique experience and this new album adds to an already impressive discography, 'Light Eternal', dedicated to Morten Lauridsen, a creator whose work expresses this great quality of bringing choral music back in the limelight on a global level. 'A man, an island and a music that moves the world' is the motto on the artist's website.